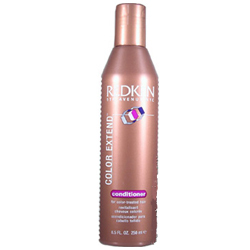 Color Extend Conditioner for color treated hair detangles and leaves hair vibrant and shiny. Redkens exclusive Interbold Conditioning System delivers proteins, anti oxidant vitamin E and sunscreen to protect and extend the life of hair color and leave hair vibrant and shiny.Sunscreens: Help with UV ProtectionAnti Oxidant Vitamin E: Helps Preserve ColorProteins: Helps StrengthenAfter using Color Extend Shampoo, apply and distribute through hair. Rinse.